Damai Indah Golf , the brainchild of well-known Indonesian real estate developer and business baron, Ir. Ciputra, consist of two international championship courses in completely different and challenging surroundings: Bumi Serpong Damai course, located in the West Java satellite city of Bumi Serpong Damai; and Pantai Indah Kapuk course, located along the Java Sea in North Jakarta. best five of Asia Pasific Course of the Year 2000 — Hertz Int’l Golf Travel Award. 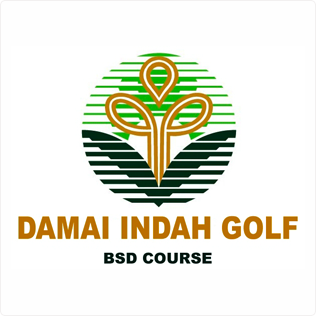 Bumi Serpong Damai (BSD) Course has been designed to offer an enjoyable mental challenge within a visually appealing setting with every hole positioned within beautifully landscape settings. As Jack Nicklaus’s maiden project in Indonesia, he ensured this remarkable 6,545-meter, par 72 course incorporated many of his personal favorite features from some of the world’s top courses. The Bumi Serpong Damai (BSD) Course is undisputably one of the best the world has to offer. In addition to the golf course, members and their guests will be able to dine at the clubhouse which boasts fantastic views of the course, swim in an Olympic-size pool, play tennis on indoor and outdoor courts, or hone their golf game at the practice facility (complete with driving range, practice green, practice bunker and chipping green).